Darren Naish: Tetrapod Zoology: Tortoises that drink with their noses, or: alas, goodbye Hololissa? Tortoises that drink with their noses, or: alas, goodbye Hololissa? My renewed recent interest in the members of Testudines (and, oh no, you can’t call them Chelonia anymore…) led me, in between writing about obscure English sauropods, to dig around on a hard drive for the following text on giant tortoises from the Indian Ocean. It’s a bit dated, having first appeared on a mailing list a few years ago, but I’ve added a bit to it and tried to incorporate new information (since it was written Paul Chambers’ book on giant tortoises has been published, but I haven’t read that yet - it’s called A Sheltered Life – and Justin Gerlach’s 2004 Giant Tortoises of the Indian Ocean has appeared). The main topic here is the systematics of the giant tortoises of the western Indian Ocean - specifically those of Madagascar, the Comores, Aldabra and the Seychelles. As yet I haven’t seen much made of this information in print, nor on the internet. Comments welcome. Recent studies, discoveries and taxonomic revisions have meant that the number of Indian Ocean tortoise species, and the genera into which these species are placed, has increased somewhat. Those previously lumped together as Geochelone gigantea are today placed in the genus Dipsochelys Bour 1982 (aka Aldabrachelys Loveridge & Williams 1957, which has been argued by some to be the correct generic name for these animals, despite Bour's contention that it is unavailable), and while this idea is widely accepted, exactly how many species constitute the assemblage is more controversial, as we’ll see. Morphologically, these are very interesting tortoises, with a particularly short supraoccipital crest and a notably deep, narrow snout with unusual nasal passages. Normally in tortoises, the channel connecting the external naris to the olfactory chamber is short and sub-horizontal, and the olfactory chamber is also short, and open to the connecting channel. In Dipsochelys, however, the external naris is vertically elongated and the nasal passage is long and ascends steeply as it approaches the olfactory chamber. The chamber itself is then quite long, and demarcated from the nasal passage by a distinct medially projecting vertical ridge. What is this all about? It seems that these are specialisations allowing Dipsochelys to drink… through its nostrils. As reported by Nick Arnold (1979), I. R. Swingland found that Dipsochelys sometimes drinks through its nose, and that these unusual features assist it in doing this. The narrow, pointed snout is better for getting the nostrils into small puddles and other bodies, and the vertical ridge at the front of the olfactory chamber seems to anchor a soft-tissue valve that prevents water from being snarfed deep into the olfactory chamber (as would happen with any normal tortoise, were it to try drinking like this). 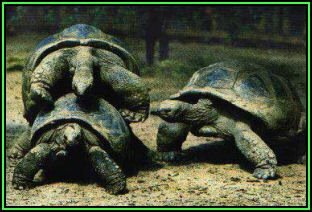 This all makes sense in a group of tortoises that have to make a living in arid environments where standing water is relatively rare. Incidentally, since this was written, Gerlach (2004a) has published the paper ‘The complex nasal structure of Dipsochelys and its identification as a true Jacobson's organ’. That certainly sounds relevant to this story, but I haven’t yet seen it. But while, as noted above, most workers – until recently – had regarded these tortoises as representing a single species, things have now become much more complicated. In 1982, Roger Bour proposed that four museum specimens from the Seychelles represented a new species which he named D. arnoldi (Bour 1982). This discovery prompted Gerlach & Canning (1998a, b) to produce a taxonomic revision of Dipsochelys. They now suggested the presence of six species: D. dussumieri from Aldabra, D. hololissa and D. arnoldi from the Seychelles, D. daudinii (probably) from the Seychelles, and D. abrupta and D. grandidieri from Madagascar. Their distinction was also supported in a study on shell morphology by Gerlach (1999) who found notable differences in how the neural bones were arranged (these are the bones that, together with the nuchal, suprapygals and pygal, form the midline of the shell). D. arnoldi was reported to be the most divergent, with a special saddle-backed morphology allowing it to be a specialist high-browser. Excepting D. arnoldi Bour, 1982, all of these names are old, so the species recognised by Gerlach & Canning (1998a, b) have been resurrected from synonymy and are not 'new' species in the strictest sense of the term. D. abrupta was first coined [as Geochelone abrupta] by Grandidier (1868), D. hololissa [as G. hololissa] by Gunther (1877), D. daudinii [as G. daudinii] by Dumeril & Bibron (1835), D. dussumieri [as G. dussumieri] by Gray (1831), and D. grandidieri [as G. grandidieri] by Vaillant (1885). Until recently all of these Indian Ocean species, excepting the Aldabran D. dussumieri, were thought to be extinct. As has been reasonably well reported however, both Bour and Gerlach & Canning reported the discovery of live giant tortoises which appeared to belong to some of the Dipsochelys taxa they identified. Gerlach & Canning explained how morphological examination and application of randomly amplified polymorphic DNA analysis (RAPDs) supported the idea that both D. arnoldi and D. hololissa were still extant in captivity. Alleged D. arnoldi and D. hololissa specimens have now been identified at zoos and wildlife parks in Mauritius, the Seychelles, Kansas, Michigan, Hawaii and the UK. This is pretty exciting stuff and has prompted a major captive breeding program. There is tons of stuff about it on the internet if you want more info. Alarm bells concerning the status of these supposed rediscovered taxa began to ring however when Palkovacs et al. (2002) could not find any differences among the purported living Dipsochelys species in the examined regions of mtDNA, and Palkovacs et al. (2003) later produced another study shedding further light on this issue (I should note that Justin Gerlach is on the authorship of both of these papers, so don’t go thinking that he’s in disagreement with this work). By studying the mtDNA of 55 captive Dipsochelys tortoises (including seven specimens identified on morphological criteria as D. arnoldi and ten identified as D. hololissa), they found that there is no evidence for genetic differentiation between extant D. dussumieri individuals and alleged D. arnoldi and D. hololissa individuals (the initial result of the RAPD analysis reported by Gerlach & Canning was put down to shortcomings with this method and the preliminary nature of the study). Instead, the results indicate the survival of just a single lineage of Indian Ocean giant tortoises. This contrasts strongly with results obtained from other giant tortoise island radiations (Galapagos tortoises and extinct Mascarene tortoises) where genetic variation between both the populations of different islands, and populations living on the same islands, is high. Given that genetic variation among surviving Dipsochelys individuals is so low - and not consistent with the survival of three species - what does this mean? Palkovacs et al. (2003) offered three possibilities. The first is that D. arnoldi and D. hololissa are extinct and D. dussumieri is the only extant Dipsochelys after all. This would mean that the morphological criteria on which extant supposed D. arnoldi and D. hololissa have been identified are utterly unreliable: an idea which matches suggestions that 'carapace morphology is sensitive to environmental conditions and that captivity can result in aberrant morphologies' (Palkovacs et al. 2003, p. 1409; see also Gerlach 2004b). The second possibility is that D. arnoldi and D. hololissa never existed as distinct taxa at all, and the differentiation of these species from D. dussumieri was and is unwarranted. As Palkovacs et al. (2003) noted, this would only be likely if Aldabran and Seychelles tortoises had not had the opportunity to diverge genetically: therefore, the populations must either have diverged very recently, or there must have been regular and substantial gene flow between Aldabra and the Seychelles. The latter option appears unlikely - it is hard to imagine that many tortoises swimming to and fro between the islands (and, yes, when at sea giant tortoises really do swim). Rapid divergence of phenotype but not of genotype is theoretically possible, but given the genetic closeness of the sampled individuals (and this assumes that the extant Giant tortoises identified as D. arnoldi and D. hololissa really are remnants of the same populations as those given these names but based on old material), should they be recognised as species separate from D. dussumieri? I suppose this would be down to personal taste - i.e., whether splitting or lumping is adopted. The third possibility is that hybridisation between Aldabran and Seychelles tortoises has obscured the true genetic distinctiveness of the D. arnoldi and D. hololissa individuals. In other words, D. dussumieri individuals introduced to the Seychelles may conceivably have swamped the mtDNA haplotypes of D. arnoldi and D. hololissa, even though the unique Seychelles morphology could persist. This idea can be discounted because the suspected hybrids would reveal distinctive microsatellite alleles not occurring in non-hybrid D. dussumieri, and they don't. In conclusion then, Palkovacs et al. (2003) showed that there almost certainly aren't extant individuals of D. arnoldi and D. hololissa. So, assuming that the museum type material of D. arnoldi and D. hololissa really does represent taxa distinct from D. dussumieri, does this mean that all the identifications of living tortoises as representatives of D. arnoldi and D. hololissa have been incorrect? Or does it mean that D. arnoldi and D. hololissa were never good species at all, but that they just represent ecomorphs of D. dussumieri? The photo (of D. dussumieri) was borrowed from the iguana site. PS - for the latest news on Tetrapod Zoology do go here. Arnold, E. N. 1979. Indian Ocean giant tortoises: their systematics and island adaptations. Philosophical Transactions of the Royal Society of London B 286, 127-145. Bour, R. 1982. Contribution a la connaissance des tortues terrestres des Seychelles: definition du genre endemique et description d'une nouvelle probablement originaire des iles granitiques et au bord de l'extinction. Comptes Rendu de l'Academie des Sciences, Serie III, Sciences de la vie, Paris 295, 117-122. Gerlach, J. 1999. Distinctive neural bones in Dipsochelys giant tortoises: structural and taxonomic characters. Journal of Morphology 240, 33-37. - . 2004a. The complex nasal structure of Dipsochelys and its identification as a true Jacobson's organ. Herpetolological Journal 15, 15-20. - 2004b. Effects of diet on the systematic utility of the tortoise carapace. African Journal of Herpetology 53, 77-85. - . & Canning, K. L. 1998a. Taxonomy of Indian Ocean tortoises (Dipsochelys). Chelonian Conservation and Biology 3, 3-19. - . & Canning, K. L. 1998b. Identification of Seychelles giant tortoises. Linnaeus fund research report. Chelonian Conservation and Biology 3, 133-135. Palkovacs, E. P., Gerlach, J. & Caccone, A. 2002. The evolutionary origin of Indian Ocean tortoises (Dipsochelys). Molecular Phylogenetics and Evolution 24, 216-227. - ., Marschner, M., Ciofi, C., Gerlach, J. & Caccone, A. 2003. Are the native giant tortoises from the Seychelles really extinct? A genetic perspective based on mtDNA and microsatellite data. Molecular Ecology 12, 1403-1413. "Giant Tortoises of the Indian Ocean"
Many thanks for visiting my blog site and for leaving a comment on tortoise systematics. I aim to get hold of your book and would very much like to see your data, but for now the book is beyond my reach (for financial reasons). You note that you disagree with the conclusions I came to. My conclusions of course echo those of Palkovacs et al., so if you disagree with their conclusions I'm confused by the fact that you're on the authorship of both of their papers. As you point out though, your book provides a more up-to-date view of your position. Moving on, I wonder if you have pdfs available of your papers: I have trouble getting access to Phelsuma, and there are also papers that you've published in J. Morphology and other journals that I still need to get hold of. I would appreciate copies of any of your papers on lizards, tortoises and bats - either pdfs or reprints (email to eotyrannus at gmail dot com). Sorry to ask, and many thanks in advance. Best wishes, and happy new year. Have you received any updates on their status? Just to let you know, Astrochelys radiata (formerly Geochelone) from southern Madagascar, can also drink from its nostrils, allowing it to drink from very shallow pools of water in the extremely arid Malagasy spiny forest.